One Yard Wonders TEASER! | Sew Lindsay, Sew! I finally completed a project from the One-Yard Wonders book I bought a few weeks ago, and I’m excited to brag about the finished product! Only, I can’t brag about it just yet because it’s a gift for someone special… shhh. I don’t want to give away the surprise! Check back soon – I’ll be sure to share the details in just a few days. I can’t wait! « Your child is wearing a pillowcase. I can’t wait to see which project you made!! I got the book this week myself (from Half.com) & am excited to make a few of the items myself. I found your blog a few weeks ago while searching the DisBoards. I’ve gone back & read quite a few-if not all-your posts so far. I’ve enjoyed reading how you started, & how you’re incorporating your love for Disney World into your new passion of sewing. I can totally relate. What made me laugh is the photos w/the photo of the sewing machine bird house at Joann’s…because I took that same photo!! Thanks for the comment, Jen! 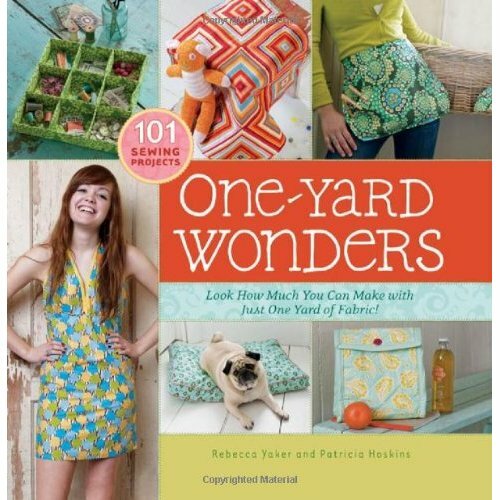 There are soooo many neat projects in One Yard Wonders! A few are a little lame, but it’s still got so many great ideas. I hope you like it as much as I do! I’m always happy to find another sewing fan or another Disney fan, but it’s rare to find someone who loves both! I’m glad you left the comment – it’s nice to know that they’re out there. I keep hearing about the DisBoutiquers thread on DisBoards but haven’t really gotten to know that group yet. And the sewing machine birdhouse… I still wish I had trees so that I would have had an excuse to get it! But a photo will have to suffice… great minds think alike! Pingback: On a (jewelry) roll « Sew, Lindsay, Sew!